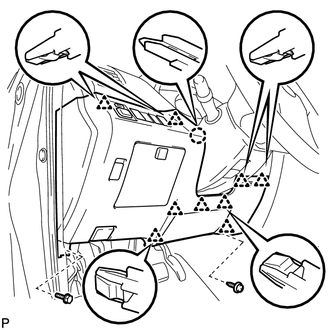 (a) Pull the defroster nozzle garnish in the direction indicated by the arrow to disengage the 4 clips, 6 claws and 6 guides. 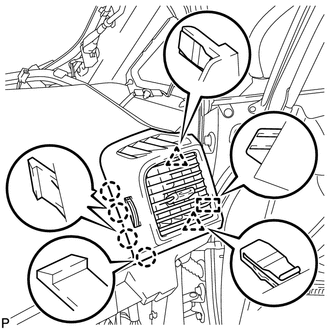 (b) Disconnect the connector and remove the defroster nozzle garnish. 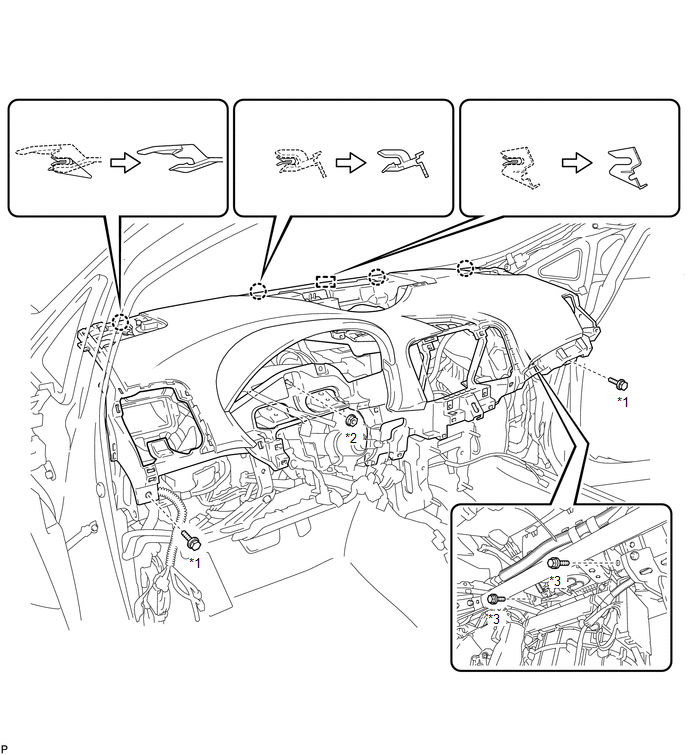 (a) Pull the upper console panel sub-assembly in the direction indicated by the arrow to disengage the 6 clips and remove it. 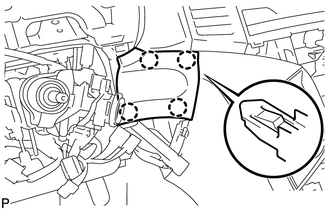 (a) Pull the upper console panel sub-assembly in the direction indicated by the arrow to disengage the 6 clips. 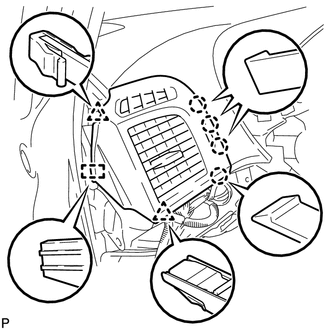 (b) Disconnect the connectors and remove the upper console panel sub-assembly. (a) Remove the bolt <C> and screw <E> or <F>. (b) Disengage the claw and 9 clips. 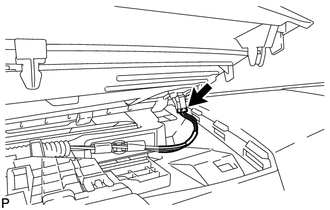 (d) Disconnect the connector and aspirator duct. 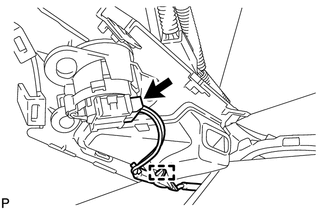 (e) Disconnect the hood lock control cable and remove the lower No. 1 instrument panel finish panel. 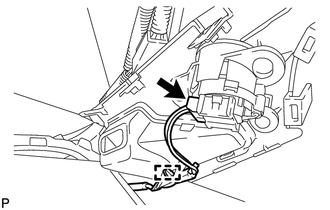 (a) Push the 3 claws in the direction indicated by the arrow to disengage them. (b) Disengage the guide and remove the No. 2 instrument panel under cover sub-assembly. 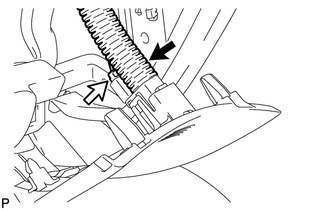 (a) Remove the bolt <C> and 4 screws <E> or <F>. (b) Disengage the claw, 3 clips and 5 guides. 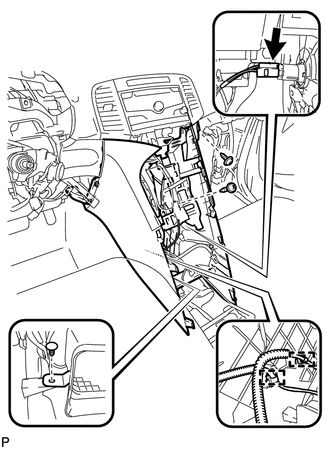 (c) Disconnect the connectors and remove the lower instrument panel sub-assembly. 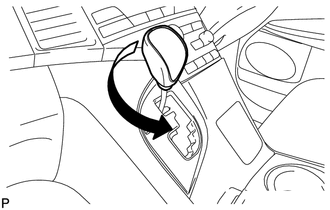 (a) Turn the shift lever knob counterclockwise and remove the shift lever knob sub-assembly. 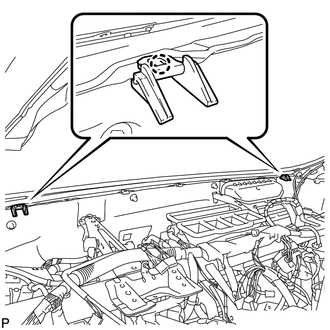 (c) Disengage the 3 clips and remove the position indicator housing assembly. 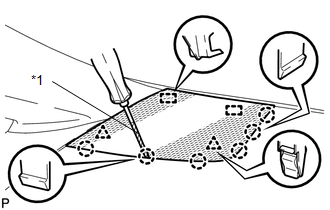 (a) Remove the 2 screws <E> or <F>. 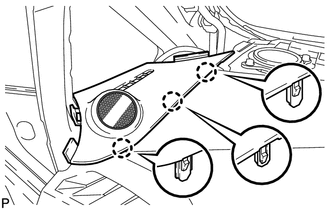 (d) Disengage the 2 clamps. 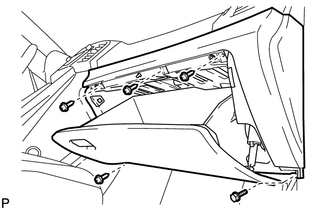 (e) Disengage the 2 claws and 4 clips and remove the console box sub-assembly. 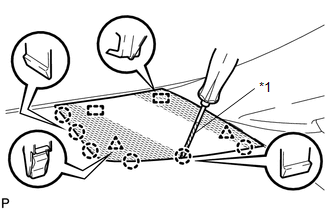 (a) Using a screwdriver, disengage the 9 claws and 4 guides, and remove the No. 2 instrument panel speaker panel sub-assembly. 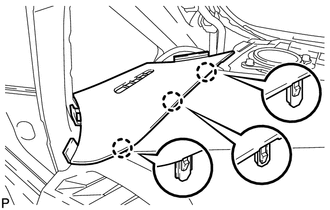 (a) Disengage the 4 claws and remove the lower instrument panel finish panel. 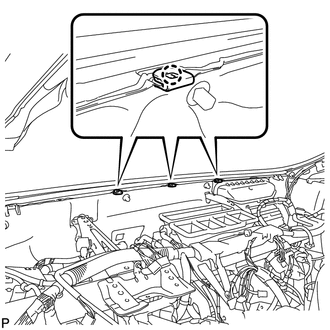 (b) Disconnect the connector and remove the lower instrument panel finish panel. 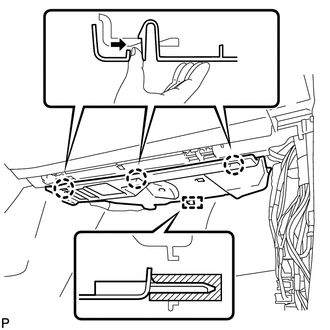 (a) Using a screwdriver, disengage the 2 clips, 6 claws and 2 guides, and remove the No. 1 instrument panel speaker panel sub-assembly. 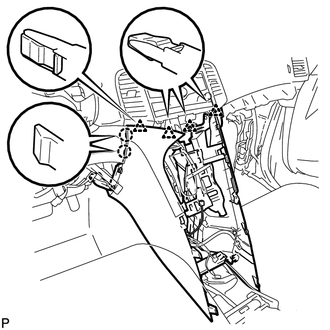 (a) Disengage the 3 claws and remove the front pillar garnish corner piece LH. (a) Disengage the 3 claws. 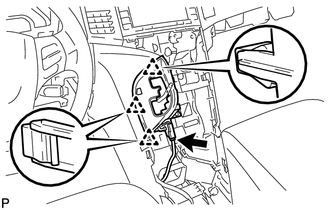 (c) Disconnect the connector and remove the front pillar garnish corner piece LH. 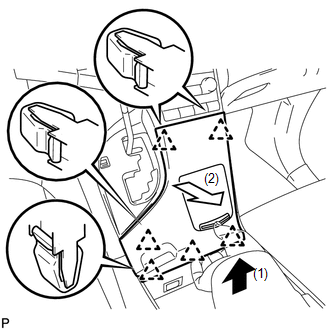 (a) Disengage the 4 claws, 2 clips and guide, and remove the No. 1 instrument panel register assembly. 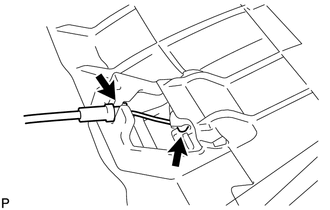 (a) Using a screwdriver, disengage the 2 clips, 6 claws and 2 guides, and remove the No. 3 instrument panel speaker panel sub-assembly. 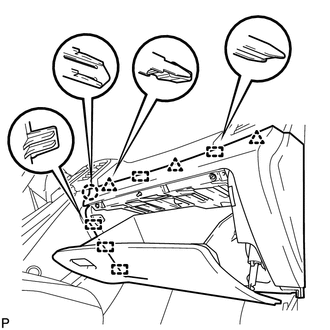 (a) Disengage the 3 claws and remove the front pillar garnish corner piece RH. 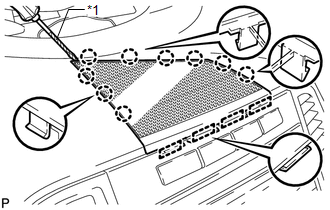 (c) Disconnect the connector and remove the front pillar garnish corner piece RH. 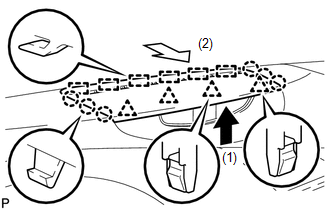 (a) Disengage the 4 claws, 2 clips and guide, and remove the No. 4 instrument panel register assembly. 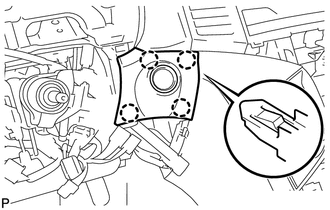 (a) Remove the bolt <D>. (c) Remove the 2 bolts <C> and nut <G> or <H>. 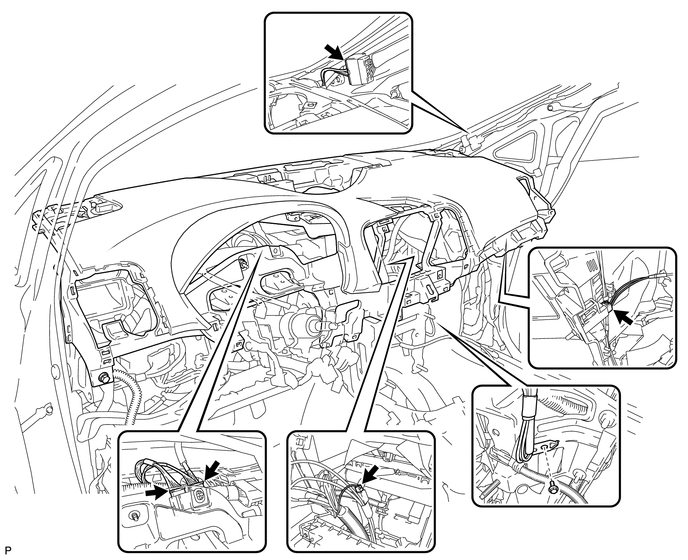 (d) Remove the 2 passenger airbag bolts <A> or <B>. 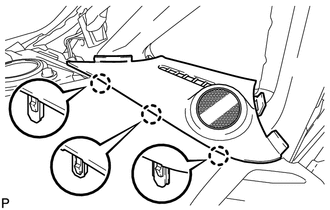 (e) Disengage the 4 claws and guide, and remove the instrument panel safety pad assembly as shown in the illustration. 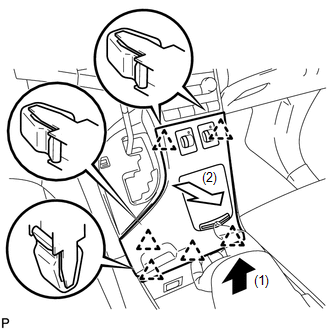 (a) Disengage the 2 claws and remove the 2 instrument panel clips. 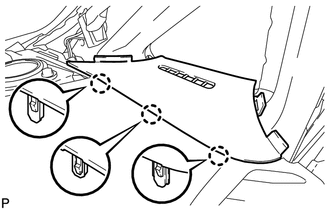 (a) Disengage the 3 claws and remove the 3 instrument panel stays.